“By now you have probably read the article from the Island Packet. NO? Click here to read…. John Dreier, mentioned in the article, is a pickleball player from Connestee Falls, NC (near Brevard, NC) and has spent the winter here on Hilton Head Island. He is adept at convincing people like newspaper reporters that they should print articles of interest in a community newspaper. He succeeded and the article in the Island Packet is the result. Thanks go to John for that accomplishment. Last month we had a visit from Ambassador Jane Harvey and her husband Fred, from Carolina Lakes, Sun City, SC and enjoyed their contributions to our program during their visit. This month we are currently enjoying a visit from Ambassador Linda Scott and her husband David from Richmond, VA. Linda is supposedly on vacation here on Hilton Head Island. 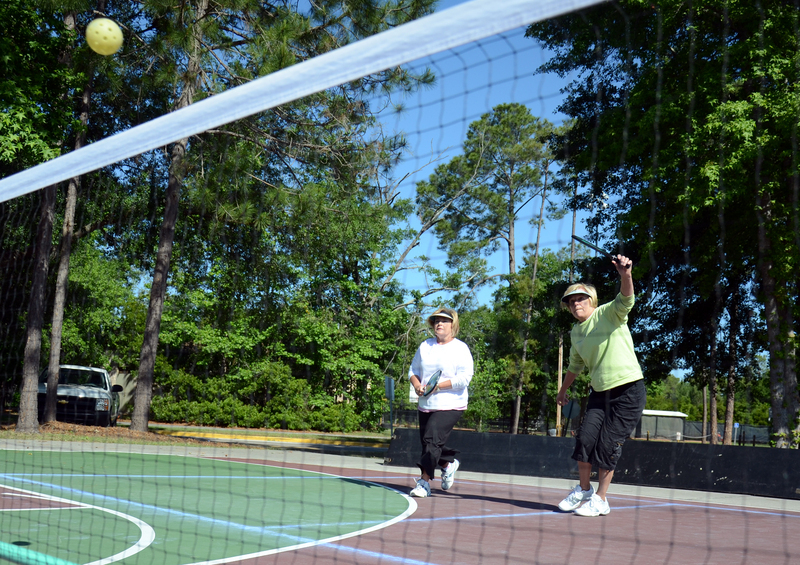 She has already done an introduction to pickleball here at Hilton Head Plantation, Hilton Head Island, SC and a clinic for beginners on the courts and an additional clinic Friday, May 4, for new pickleball players as a result of the article in the Island Packet. Pictured is David Scott displaying the "ready" position at the net during play and another is Linda Scott doing her "down and dirty" serve. I swear she digs it out of the court surface. We have all taken many skills from their visit. Thanks you two and we certainly hope to see you this fall. Pickleball is ever expanding here on Hilton Head Island and the contributions from other ambassadors and players as they either pass through or vacation here is very heart warming. 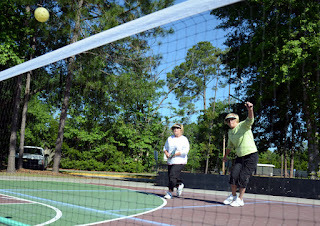 Our e-mail roster of pickleball players is now approaching 150. You may remember that my wife Mary and I were playing singles about 18 months ago."